This month's practitioners meeting involved an interesting and fruitful discussion of a new paper published in Infants and Children. The author, Deborah Fidler, of Colorado State University has been working in the field of genetic syndromes associated with intellectual disabilities, including Down syndrome since 1997. This paper clearly and concisely reviews the growing body of research into the already well-established concept of the behavioural phenotype associated with Down syndrome. [1,2] However, the major focus of the paper is to examine the profile from a developmental perspective, i.e. whether the so-called 'typical' (and some might say 'inevitable') profile presented by the majority of individuals in childhood and adolescence is already present and/or becoming established in infancy. She frames this question within the context of early intervention, highlighting the necessity of creating a curriculum and style of delivery, which is grounded in scientific research evidence regarding children with the specific diagnosis of Down syndrome and not a programme that simply fits a wider target audience of children with developmental delay. This review does not aim to describe the typical profile as Sue Buckley reviewed this very clearly in her article 'Specificity in Down syndrome' in the last issue. Instead, the aim is to draw out the conclusions of Deborah's paper with regard to the development across time of the phenotype and some of the implications of this for early intervention and school support. The term phenotype describes sets of observable traits, as determined by both genetic makeup and environmental influences. Deborah explains that phenotypes are 'probabilistic'. [pp.87] This means that people who have Down syndrome are more likely to share one or more characteristic specific behaviours, as opposed to those with a general developmental delay. Secondly, not every child with Down syndrome will show all the behaviours and thirdly some of the behaviours associated with Down syndrome may appear in other syndromes. Phenotypes are purely descriptions of characteristics, which often appear together as a syndrome. The phenotype does not explain why these traits appear together or how they might interact. The concept of critical and sensitive periods is a controversial one in the research literature, not least due to the fact that the term 'critical' implies that once a certain window of opportunity has passed, one can never acquire a skill with the same degree of competency. However, it is likely that there may be times when the brain is more receptive to certain types of learning. It is likely that there is, for example, a sensitive period for learning grammar and this is particularly salient for children with Down syndrome, for whom this appears to be a particular area of weakness. [see 4 for more information] This led the team to discuss the potential of early reading for developing children's verbal short-term memory, syntactical knowledge and use of grammar in their expressive language. We discussed the fact that those children who had started reading activities early at the age of 2.5-3.5 years of age and had developed extensive sight vocabularies may have made better progress with regard to the effects on speech and language, particularly grammar development, than those who started later. Interested readers are referred to Reading and writing development for individuals with Down syndrome - An overview  for a discussion of these findings. This is, of course, not to say that targeted intervention at any age is ineffective, as many adolescents and adults with Down syndrome have demonstrated significant progress in a wide range of skill areas, including literacy, later in life. The old adage 'better late than never' comes to mind even if 'it's never too late' is not always quite the case. An extremely important point raised by this article, which must be highlighted to every individual working or caring for a person with Down syndrome, is that a diagnosis of Down syndrome in early infancy does not predict the future in any certain way. Development is a dynamic process, whereby experiences within the environment are key to the way in which the brain itself develops and is organised. The idea of a typical profile associated with Down syndrome is important to gain a general understanding of which styles of intervention may be helpful however, each individual with Down syndrome will only share the typical traits to a greater or lesser extent, some may share characteristics of other syndromes, some may have a full diagnosis of another syndrome, as Sue Buckley describes in her article on dual diagnosis, see p. 114 of this issue. As we shall see in the section on implications, below, this point is crucial with regard to the ways in which parents and professionals interact with the children as no single approach will be equally effective for every individual with Down syndrome. Ideally, intervention should start as early as possible and should always actively involve parents and children. Also, it is likely that parents who understand the rationale behind different aspects of the intervention will be more successful in their targeted work at home. Therefore, some degree of overt training may be necessary as well as modeling practical activities and games to the parents. The activities are likely to be most effective when they build on the children's visual and social strengths and are tailored to the individual likes and dislikes of the individual children. One way in which this idea can be applied is by embedding opportunities to display skills which are likely to be more difficult for the child (e.g. speech sound production or precise fine motor movements) within tasks that will be perceived by the child as 'do-able' and fun. For example, action songs or pretend play scenarios, which are often extremely popular, could be used as a context in which to practice particular speech sounds. Also, it is important to collect information from families about activities, toys, topics and so on which will be particularly motivating to each individual child so that these can be incorporated into activities to target specific skills and as reinforcers (rewards). One can begin to see from this discussion that for early intervention for children with Down syndrome to be most effective, a collaborative approach between practitioners and parents is essential. Deborah also draws the reader's attention to research on personality and motivation, which indicates that many children with Down syndrome share certain qualities, which manifest themselves in a characteristic style of social interaction. [pp.92-93] Although the literature on temperament in infancy suggests that infants with Down syndrome show the same distribution of temperaments as typically developing infants, by childhood there seems to be a tendency to show decreased task persistence and variable motivation during work-related situations. Many children can be seen to utilise their strong social skills to engage others in 'diversions' and collude with them in a variety of behaviours unrelated to the learning task. She also cites research that indicates that children with Down syndrome tend to make more efforts to elicit help from adults than to persist with a task and develop their independence and problem solving skills and a study, which suggests that children with Down syndrome are less likely to repeat previous successful outcomes. [p.93] These observations may be helpful in developing guidelines to help those who support and particularly are involved with testing and assessment of infants and children with Down syndrome. However, it was noted above that children with Down syndrome show enormous individual variation. As practitioners, an understanding of the behavioural phenotype is extremely useful for those working with infants and children with Down syndrome at one level, (e.g. curriculum planning) but on an individual level, it is also crucial to take a step back from the profile and simply observe the subtlety of the behaviours displayed by the child and the exact situations in which they occur. This paper provided an interesting starting for point for a discussion, which helped us to reflect on our practice with children and families both in early intervention and school liaison. It also provided ideas for future publishing and training activities and inspired us to think about potential research questions for the future. Fidler, D.J. (2005). The emerging Down syndrome behavioural phenotype in early childhood. Infants and children, 18(2), 86-103. Hodapp, R.M., DesJardin, J.L. and Ricci, L.A. (2003). Genetic syndromes of mental retardation: Should they matter for the early interventionist? Infants and Young Children. 16(2), 152-160. Hodapp, R.M. and Freeman, S.F.N. (2003). Advances in educational strategies for children with Down syndrome. Current Opinion in Psychiatry, 16, 511-516. Van Kraayenoord, C.E., Moni, K.B., Jobling, A. and Ziebarth, K. (2002). 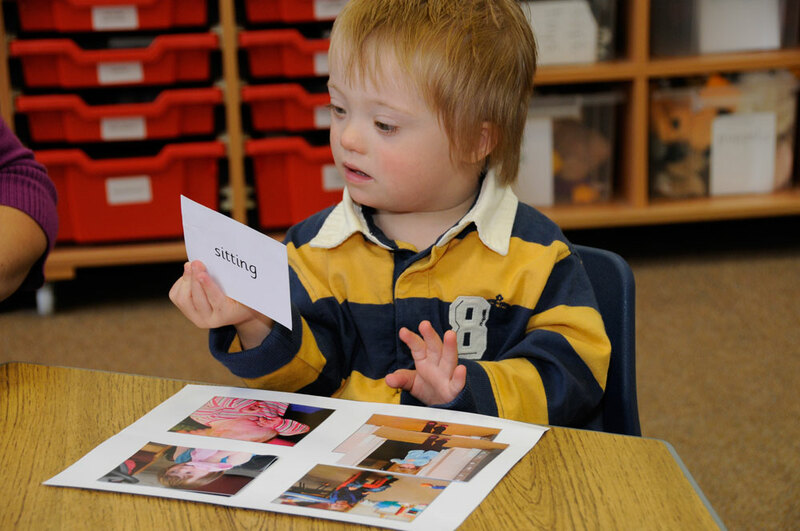 Broadening approaches to literacy education for young adults with Down syndrome. In M. Cuskelly, A. Jobling and S. Buckley (Eds.). Down syndrome across the life span (pp. 81-920). London, England: Whurr Publishers Ltd.